The streets gleamed as if polished and hordes of tourists meandered by, as I was sitting in the main square of Dubrovnik, Croatia. I had hardly touched my sketchbook in the first half of the trip because I had been traveling faster (a bit of a mistake). Now I had set off to head to the Balkans and take my time enjoying each place fully. 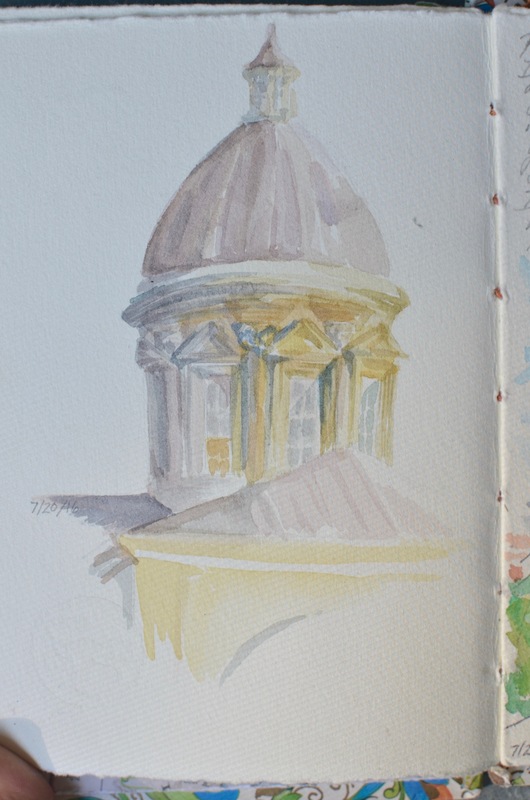 Thus, I had lugged my sketchbook and watercolors into town and was racing the setting sun to capture the dusky glow that graced the Dubrovnik cathedral. A note for those who have seen artists in the street, working: come up and approach us, we may be in our own heads, but we don't mind a conversation. Too often, I watch people point and talk about me, and yet they are afraid to walk up and address me. I'd be happy to share my work with you, simply ask to see it. You can read about my first day in Dubrovnik, here. It's been a bit since I've posted, due to the craziness of personal life and being back at home. Don't worry--I won't stop now! Even though the major travel of my gap year is over, I'll be keeping up with this site. Hopefully I will transfer to a new website name near the end of my summer to document future travels. "A Page from Elsewhere" will still be posted this summer, but on not so strict a schedule. Today's doodle is inspired by Dead Poet's Society. "Carpe diem," meaning seize the day in Latin, may sound simple. Yet it is too often that we don't take action. We grow complacent in what we know, instead of striving to achieve new goals. The whole reason for my gap year can basically be summed up in those two short words. I could have traveled after college, before I got a job, or when I retire. I didn't. Because if I said that I would travel an elusive someday then maybe that day would never come. So I made my dream happen. Bangkok surprised me. I didn't think I would like it at all. I misjudged it, thinking it would just be too chaotic and polluted to enjoy. What I did not anticipate was having so many interesting things to do there or so many nice greenspaces to stop and take a breath. Check out my last post to hear about things to do for free or very cheap and get a bit of advice about transportation. This cutie pie was in Wat Po guarding the gate to one of the temples.